Come and see fabulous costumes, meet the designer and creator. Try your hand at making some art. Unbeknown to many in Melbourne’s West, Vernon Street, South Kingsville boasts one of the most eclectic and admired award-winning costume jewellery designers and art teachers in Australia. Anna Kolusniewski’s exquisite jewellery and bespoke garments draw upon years of training in silver-smithing, jewellery design and fine art. 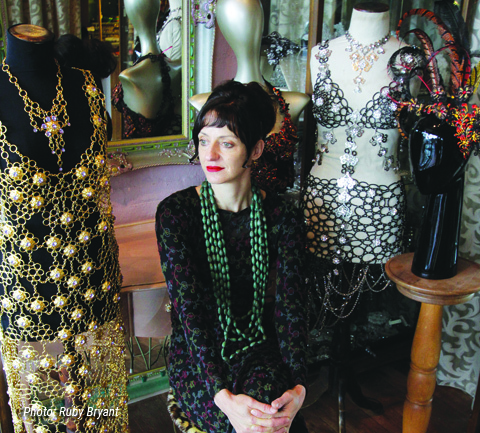 Her creations include vintage-inspired bridal pieces through to metal costumes and roaring 20’s designs for film and the stage. Recognised as one of Australia leading costume jewellery designers, Anna also runs term-based visual art and holiday programs for kids and workshops for adults.